Liked the room and how quiet it was. Liked the food from the restaurant. Liked the front desk staff. Easy to het to from NYC and free transportation to Newark airport were key drivers for us staying here. 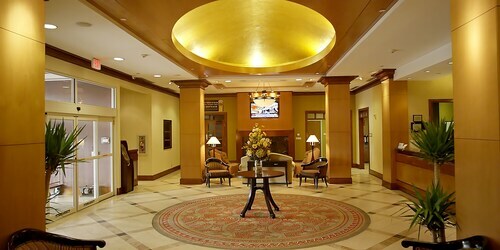 Its one of the nicest hotels in Newark. Staff was extremely friendly and polite. Rooms were clean but not extraordinary. Gym wasn’t great. Very minimal equipment for an actual workout. Pool was amazing. Fast internet.Great condition rooms and facilities. The comfort of the rooms and seperation of each room. I liked the layout and it had a resturant in the hotel. I did not like that the parkling lot was dirty and had to pay for parking. Looks sketchy outside but this is a high quality property. Rooms are clean and food is pretty good. The hotel was nice. The staff was pleasant. Easy checkin and checkout and the ladies at the front counter were attentive as well. The only thing I didnt like was the location. It was close to the airport but yet far from restaurants and gas stations. Overall good experience. Newark, the largest city in New Jersey, is home to a remarkable amount of cultural diversity and fabulous architecture, museums, and a thriving performing arts scene. Whether visiting the Cathedral of the Sacred Heart or the Newark Museum, all top attractions are easily within reach of most top hotels in Newark. 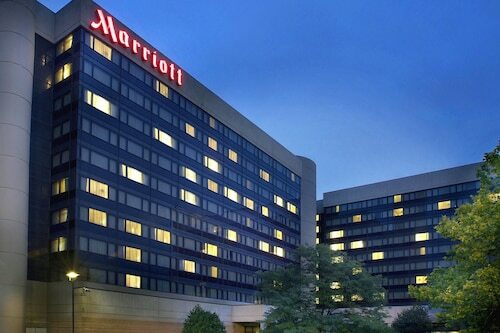 Travelers to the city have a wide variety of Newark hotelsto choose from, including budget and business suites, and bed and breakfast inns. Tourists staying at hotels Newark have the opportunity to tour impressive museums. Visit the Newark Museum, the largest in the state, and the New Jersey Historical Society, as well as the Jewish Museum of New Jersey. Do not miss the opportunity to experience the magnificent Gothic structure of the Cathedral Basilica of the Sacred Heart, one of USA's largest Gothic Cathedrals, located on Ridge Street. Newark's performing arts scene has found many admirers, and the New Jersey Performing Arts Center is home to New Jersey State Opera and New Jersey Symphony Orchestra. With an array of culinary delights, Newark guests should visit the Spanish Tavern and Casa Vasca for Spanish cuisines, or try the Garden State Diner for wine and American food. The De Caneca Restaurant offers Portuguese fare and is located on Elm Road. Visit downtown Newark to find specialty shops and galleries filled with interesting and unique gifts. The city's Ironbound shopping district is also home to great shopping options for name-brand items and specialty shops like Lillies Fashion Boutique. It was a very clean and updated hotel. I was very impressed of the hotel based on the price point. Bed was comfortable, sheets were quite nice as well! Food was surprisingly good for a free breakfast! I would definitely stay here again when we come back to the area!